Jesus miraculously feeds the 5000. Image via lds.org. During His mortal and post-mortal ministries, Jesus fed large multitudes on several occasions. Understanding these miraculous stories can increase our appreciation of Christ’s Atonement and His power to provide physical and spiritual nourishment each day of our lives. After hearing the tragic news of the death of John the Baptist, Jesus went into a mountain to be alone (Matthew 14:12–13). The emotions Jesus felt for the loss of His beloved relative and knowing that He Himself would soon face a similar fate, must have been overwhelming. As Jesus sought solitude, we are told that a large multitude followed Him. Remarkably, the scriptures record that in this moment of great sadness, Jesus was “moved with compassion towards them” (Matthew 14:14). Instead of turning them away in His time of mourning, Jesus healed the sick and ministered to them. As the day became evening, Jesus turned to His disciples and asked them to feed the large multitude. Although the scriptures only state that 5,000 men were present, the multitude may have been as large as 10,000 to 20,000, when including women and children. The disciples exclaimed that it would be nearly impossible to feed such a large multitude, but Jesus still asked them to bring all that they could find. A young lad was found among the multitude who had five loaves and two small fishes (John 6:9). This boy was willing to give his all, even though it surely seemed insufficient for such a huge gathering. Yet Jesus went on to demonstrate that He can transform any willing offering into something far more than enough. After blessing the meager offering, Jesus distributed the food to His disciples who then served it to the multitude. Miraculously, the entire multitude was fed from the small gift of this young boy, with 12 baskets remaining full of food. In all four accounts of the feeding of the 5,000 and also the two accounts of the feeding of the 4,000, the Gospels state that the multitude was “filled” (see Matthew 14:20, Luke 9:17, and John 6:12 for example). This may seem to refer only to physical nourishment, but when compared to the story of Jesus feeding a multitude during His ministry among the Nephites, a new interpretation presents itself. 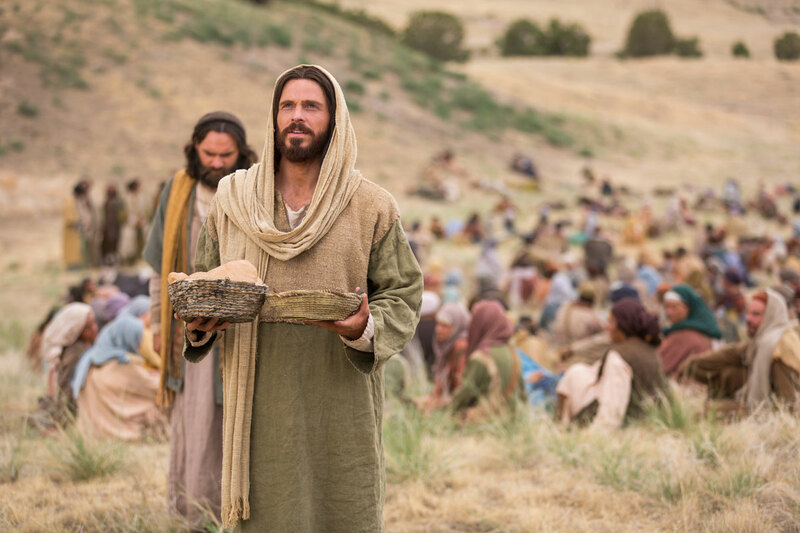 On the first day of His three-day ministry among the Nephites, “Jesus commanded his disciples that they should bring forth some bread and wine unto him” (3 Nephi 18:1). He then blessed it, and gave it to the multitude, instituting the sacrament. Similar to the wording in the New Testament, the Book of Mormon states that after partaking of the bread and wine, the multitude was “filled” (see 3 Nephi 18:4–5 and 18:9). On the second day, Jesus again administered the emblems of the sacrament, however, with one major difference. On the first day, the disciples provided the bread and wine, whereas on the second day the Lord miraculously provided the bread and wine. The record states, “Now when the multitude had all eaten and drunk, behold they were filled with the spirit and they did cry out with one voice, and gave glory to Jesus whom they both saw and heard” (3 Nephi 20:9; emphasis added). Notice that the multitude was again filled, but this time they were filled with the Spirit! So what do these stories teach about the Savior and His Atonement? First, they show that the Savior will always minister to us, even when He Himself might be mourning or suffering. We can always turn to the Lord and know that He will heal us, minister to us, and feed us. Second, when we bring our meager gifts to the Lord, He has the power to make them not only enough, but more than enough. Third, Jesus likely fed the multitudes to foreshadow the significance of the sacrament and how the Atonement can strengthen and nourish us physically and, most importantly, spiritually. Just as a small piece of bread and small cup of water become part of the human body as they are digested, so too can the attributes of Christ become a part of our very spiritual identity, preparing us for life eternal. As Jesus stated in John 6, just after feeding the multitude, “I am the bread of life, he that cometh to me shall never hunger; and he that believeth on me shall never thirst.” As we come to the Savior each Sabbath day, we are given this same powerful promise, to be filled with the Spirit of the Lord! (see Moroni 4:3).